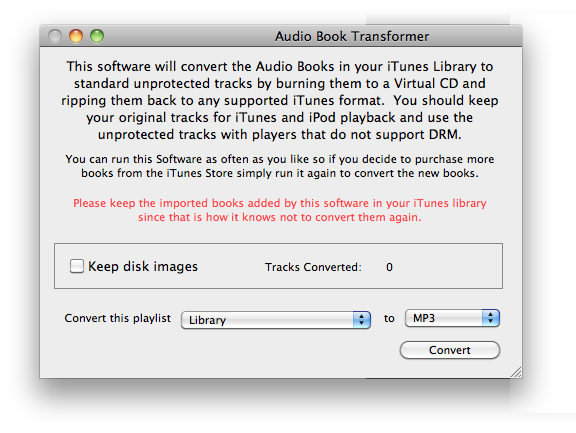 Audiobook Transformer takes the drudgery out of converting your iTunes Audiobooks to MP3 on Mac OS X so you can listen in the car, or on any device that doesn’t support the audiobook format. Use it to convert from iTunes Audiobook to MP3, AAC, Apple Lossless, AIFF or WAV – whichever format your device will play. Now you can listen to your Audiobooks while you drive! Audiobook Transformer does the rest for you. When the operation is complete you will have a new playlist in iTunes that contains the imported files. In addition to converting the audio books you can have Audiobook Transformer automatically keep a copy of the Virtual CD Disk Images and, if you buy the bundled copy of Virtual CD-RW, it can mount those disk images for use at any time. If you want to burn your new MP3 playlist to a CD, we recommend using iTunes or mirethMusic CD burner software.